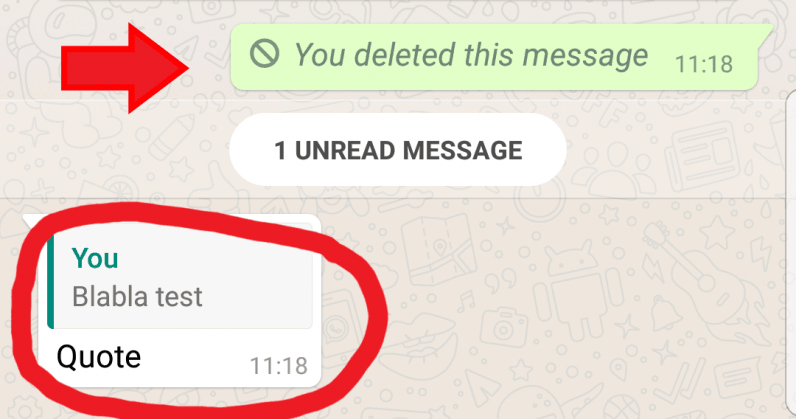 A couple of months back WhatsApp introduced the ability to delete embarrassing messages you sent by mistake before your contacts have had a chance to peruse them. But it seems that the feature doesn’t always work as intended – especially when someone has already quoted the text you want to purge. We noticed that quoted messages in group chats continue to show in quotes even after they have been wiped. Attempting the same thing in a private chat bred the exact same results. It would appear that this is another instance of the classic “it’s a feature, not a bug” conundrum. We’ve reached out to WhatsApp for a clarification. In any case, you should probably mind what you say when you talk to people who are in the habit of using quotes. As you can observe in the screenshot, while the original message will successfully disappear, the deleted text continues to show in the recipient’s quote. WhatsApp highlights in its FAQ that you can only delete messages for up to seven minutes after they have been sent – as long as both the sender and the recipient are using the latest version of the app. Curiously, it makes no mention how the feature works in cases of quotes. It is worth noting that researchers have previously discovered other shortcomings in WhatsApp’s implementation of deleted messages. One particularly gnarly flaw – discovered by Spanish tech blog AndroidJefe (original in Spanish) – made it possible to recover deleted messages from the Android notification history. Relying on third-party apps, users could browse the notification log to read purged texts. The Independent later pointed out that, relying on this approach, they were able to only recover deleted messages that they had previously read or interacted with.